Another year, another lift out. Geke dropped me off on Thursday night, so I would have time to prepare lines around the hull, helping the lifting straps to be pulled under the boat and back up on the other side. Friday was a nice wet day. I calculated that at 11:30 there would be just enough water to reach the fuel berth. As I was called up, there was 10 cm water under the keel. I moored up with the depth alarm screaming. 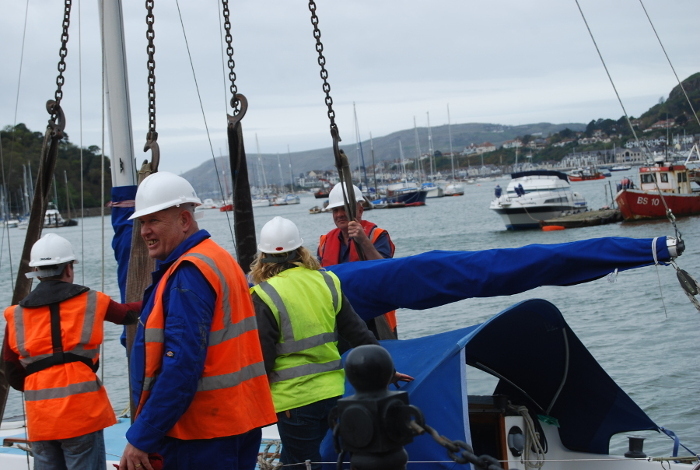 Outside the routine jobs as anti-fouling and checking the seacocks, a range of other tasks had to be done. Improve stowing in the starboard locker. Handle for the bilge pump, which did not fit up to now. Sea railing replacement for starboard. And not to forget, the name change. 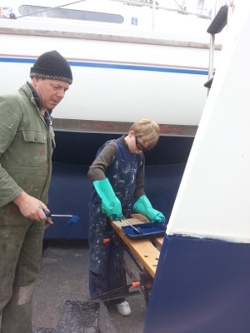 Anti fouling and workin in restricted spaces. all childrens jobs. 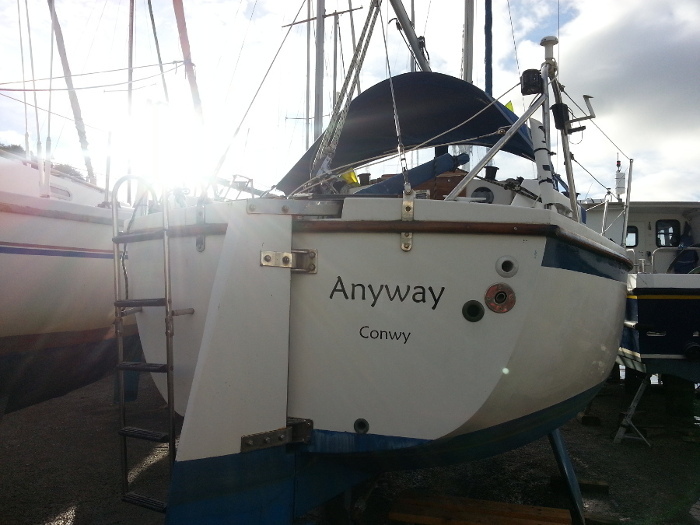 The family had decided that the current name of the boat, Hazel Anne was not very much related to us (1st owners wife I believe) and some evenings were spent coming up with a new one. After most characters from the Lord of the Rings were rejected, Geke decided on Anyway. Annie is the name of her mother, and has the double meaning of "any direction". To lift back in, one needs 3 men and 1 woman. As I could not get time off work to lift her back in, Geke (and 37 men giving directions) had to take care of this. All went well, except that the boat doesn't make much way with the gear lever in neutral. 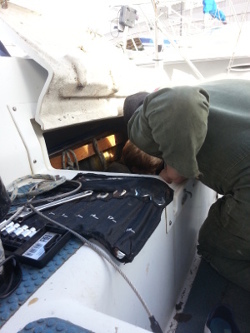 The source of the slow progress towards the bridge and inevitable dismasting was discovered and after a corrective manouvre she moored her up on our spot on the pontoon.